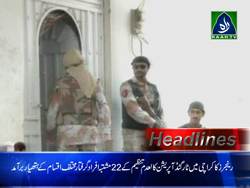 Rangers targeted operation in Karachi, 22 arrested, different type of weapon found. Federal Government should immediately appoint chairman NAB – Iftakhar Muhammad Chohdry. Sartaj Aziz met Indian Foreign Minister in Kirghistan, LOC stress discussed.